Mix together the fresh spinach, ricotta cheese, fontinella cheese, dill, salt & pepper. 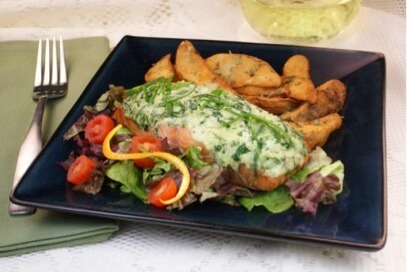 Place a generous amount of the spinach & cheese mixture on top of each piece of salmon. Gently pat the mixture into place on top of the salmon. Place the salmon in a 375 degree oven and bake for 15-20 minutes.